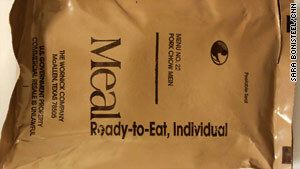 Military MREs are ready to eat, but sometimes, troops like something that tastes a bit more like home. Troops: Morale is about the amenities sent from families, friends in U.S.
(CNN) -- When Command Sgt. Maj. Michael T. Hall of the International Security Assistance Force announced that fast-food offerings like Pizza Hut, Dairy Queen and Orange Julius were being shuttered in Afghanistan, he was blunt about it. "This is a warzone, not an amusement park," he wrote on the ISAF blog. These mobile restaurants and others that can be found on large bases in Kandahar and Bagram, are "nonessentials" and are being shut down to streamline delivery of much-needed battlefield supplies. However, according to some soldiers and Marines -- all of whom have served in combat in Iraq or Afghanistan -- access to the familiar hometown mall fare isn't as important to morale as many civilians may have thought. The announcement of the fast-food outposts' shuttering inspired a lively debate on CNN's Afghanistan blog about morale and the amenities afforded servicemen and women serving overseas -- often in harm's way. Those affected, however, didn't seem very concerned. Especially appreciated in these care packages are sweet, sour, salty and spicy condiments, such as Tabasco, sugar packets and seasoned salts for enlivening the military's frequently derided Meals Ready to Eat -- individually packaged rations for service members stationed away from meal preparation facilities. These high-calorie MREs, which have long drawn criticism for depressingly bland flavors and textures, are precisely what Crouch, who served two tours in Iraq, says drove his fellow troops to seek out more flavorful, familiar fast food. Others look a little closer to their temporary home, sampling the local fare. While many soldiers out on combat patrols were, according to Army Capt. David Swaintek, "too tired and drained to care much about their meal," he developed a taste for Iraqi flavors during his tour, which lasted from 2002 to 2008. While he stands up for food on base, calling it "decent" and "healthier" than fast-food alternatives, he still misses his favorite flatbread, which he'd buy while out on patrol, and he laments not being able to find anything like it stateside. Similarly adventurous, previously deployed Marines now at California's Camp Pendeleton don't have to venture far from their barracks to indulge in the Middle Eastern-style specialties they've come to love. According to the Marine Corps Times, DedeMed's Shawarma House now serves the eponymous gyro-like sandwich -- as well as hummus, tabbouleh salad and baklava -- to Marines who'd been stationed in Iraq and the Persian Gulf. Swaintek, while lauding the indigenous cuisine, also cried foul about fatty U.S. fast foods, saying that "overweight soldiers are a problem." Army Sgt. Paul Williams, who is serving in Iraq, agrees with the captain but indulges in "the occasional pizza from Pizza Hut, burrito from Taco Bell, or maybe even a sandwich from Subway," citing the virtue of being able to enjoy a pizza in the middle of the desert and escape for a few minutes to talk with fellow soldiers about their homes, sweethearts or future plans. Ultimately, though, the military is a culture of intense physical fitness, and access to nutritious meals at mess halls helps servicemen and women maintain their physical and psychological. edge. And Williams says that "a soldier has a responsibility to maintain himself." While deployed troops can certainly take the reins of their physical health, friends and family stateside can still boost morale and offer a taste of home with much-appreciated care packages. The Department of Defense maintains a list of links to groups coordinating care packages for overseas soldiers. According to the U.S. Department of Agriculture, most foods that are tightly prepackaged and immune to mold or bacterial growth are safe for sending to soldiers. They recommend dried proteins, like beef and turkey jerky, as well as dehydrated soups, dried fruits and even dense baked goods like fruitcakes. Just make sure to seal it all up with a kiss.